Amber Moon and Stars whiskey old fashioned 3 3/4"
Moon and Stars pattern whiskey glass measures 3 3/4" tall and top diameter measures 3 2/8". Not sure if thiswas made my Smith or another company. Nice and heavy, good quality like Smith but I could not find this size listed in their inventory. Perfect condition. I just have one. Possibly this may be the bottom of a covered dish too. Maybe you know and need it. LE Smith Moon and Stars small tea canister.This vintage tea canister is in mint condition with no chips or cracks and no sign of wear. 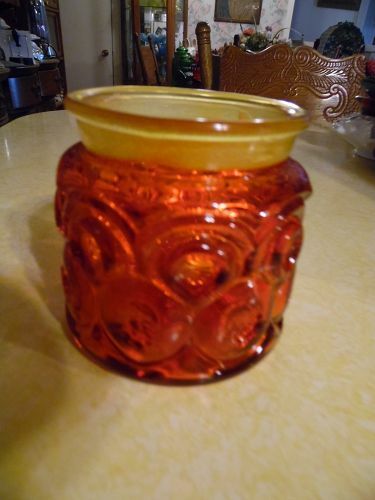 This one is 5 1/8" in height with the lid in place. The diameter is 4". See other pieces and colors I have in my catalog. Bottom part of the gold fairy lamp in the moon and stars pattern. Perfect condition but there is no top. A nice replacement piece if you have broken your bottom. 2 7/8" tall and has a diameter of 4 5/8". Inside sits a little ledge for the top to rest on. Perfect condition. Bottom part of the fairy lamp in the moon and stars pattern. Perfect condition but there is no top. A nice replacement piece if you have broken your bottom. 2 7/8" tall and has a diameter of 4 5/8". Inside sits a little ledge for the top to rest on. Perfect condition. 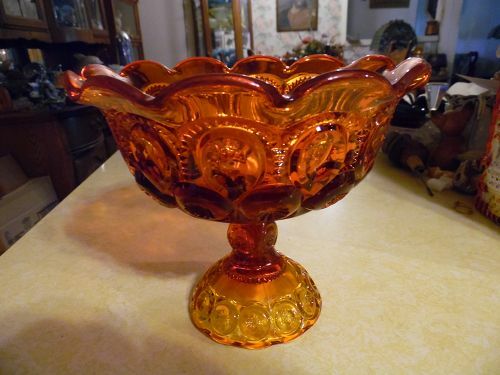 Beautiful large footed open sugar bowl in the Moon and stars pattern in a beautiful red amberina. 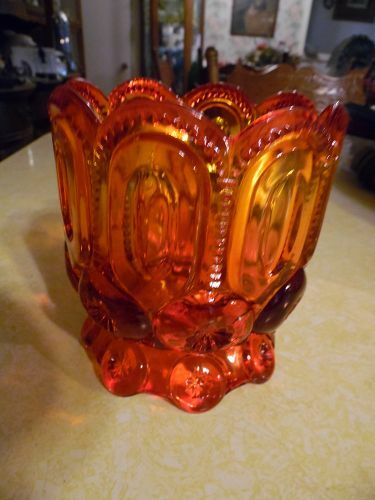 Measures 5 1/4" tall, and a top diameter of 4 1/2".Beautiful coloring and is in perfect condition. I personally could find lots of useful purposes for this other than a sugar. See all of my other pieces in this pattern I will be listing. 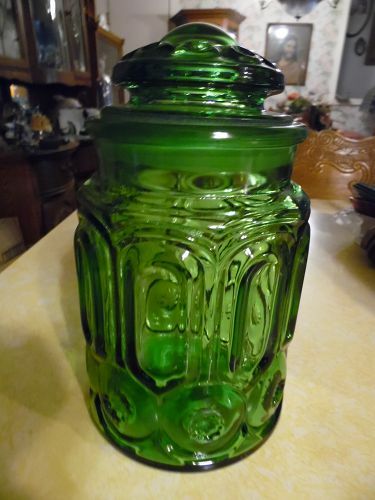 LE Smith Green Moon & Stars Sugar Canister 9 1/4"
Beautiful Emerald Green LE Smith Moon & Stars Flour Canister 11"
Beautiful vintage LE Smith Moon & Stars Flour Canister/apothecary jar. 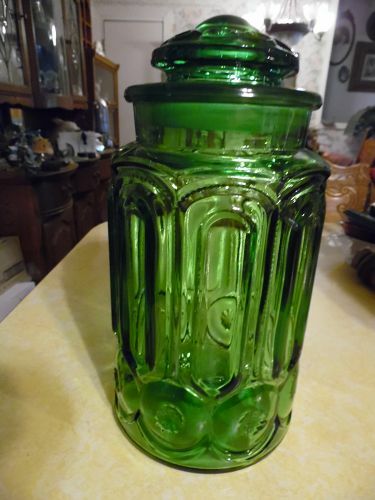 This emerald green canister stands about 11" with the lid and is in excellent condition. I have others listed in this color in assorted sizes. Check out the catalog for other moon and Star pieces. Vintage L.E. 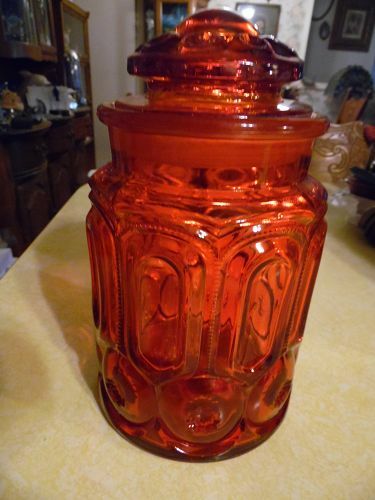 Smith Moon & Stars Red Amberina Glass Canister. Measures 3 7/8 tall with no lid as shown. (5" Tall if there was a lid), 5" Wide. This part is in perfect condition. This is the small tea canister of the 4. 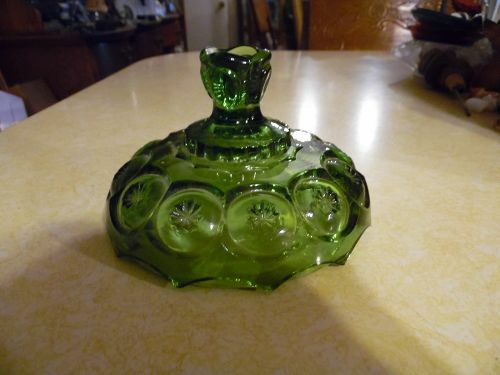 No lid.See other pieces of this pattern I have listed in my catalog.Different pieces and colors. 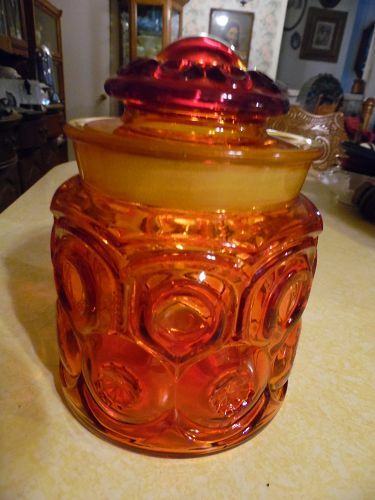 Vintage LE Smith Red Amberina Glass Moon & Stars 7" Canister With Lid. 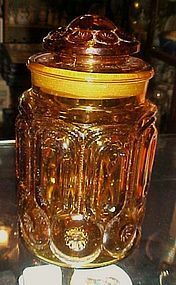 Jar itself is in PERFECT condition. The lid has a chip on inner part and chips on outer top. REQUEST PHOTOS IF YOU LIKE. Please take a look at all of the Moon & stars items I will be listing. Beautiful vintage LE Smith Moon & Stars Flour Canister. 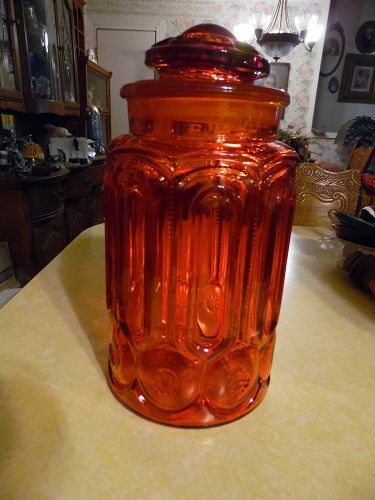 This amberina/red canister stands about 11" with the lid and is in excellent condition. I have others listed in this color in assorted sizes. I have 2 in this size, price is for each. Check out the catalog for other moon and Star pieces. 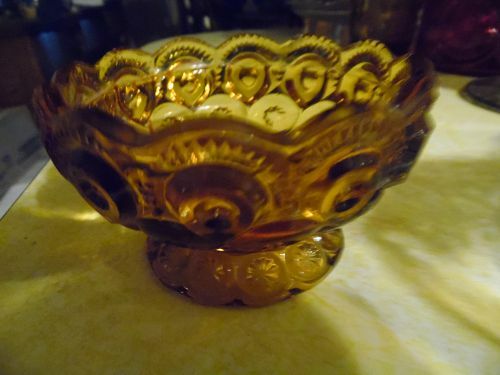 Vintage LE Smith amberina Moon and Stars footed bowl 7.5"
"Moon and Stars" patterned footed bowl, by L.E. Smith. This bowl is amazing. It measures 7.5" in diameter and 4" tall. The Amberina color is breathtaking in rich coloring. The pictures do not do this piece justice in terms of the color. It is much more vibrant in person. Definitely a great piece for any glass collectors, or fans of L. E. Smith. Pristine condition. See other pieces I have listed in this pattern I will be listing. 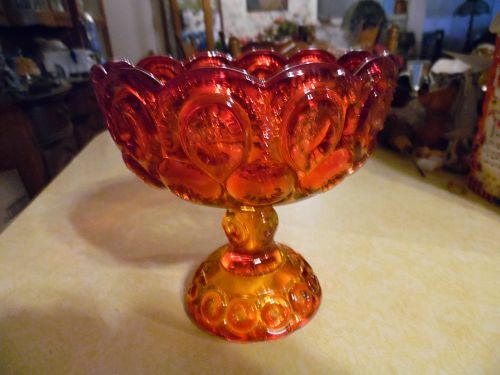 Vintage Amberina Moon & Stars Pedestal Open Compote Candy Dish Measures approximately 6 1/2" tall, 6 1/4" across the top and 3 3/4" across the base. Vintage but excellent condition. No chips. No cracks. I have 2 in this size available. Price is for each. I will be listing more of the moon and star in my catalog. 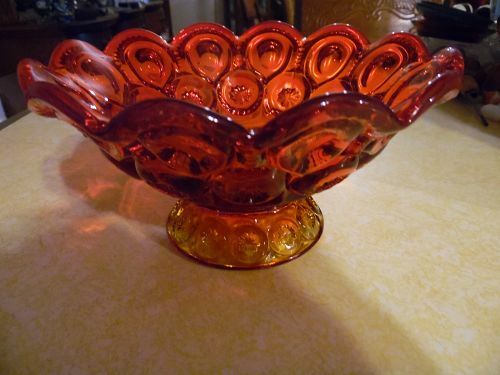 Lovely red amberina glass compote made by LE Smith in the 1970's.Pretty flared petal to edge. It is in very good condition with no chips or cracks. It is almost 7" tall and the top is 8" across.See my other Moon and Star I will be listing. 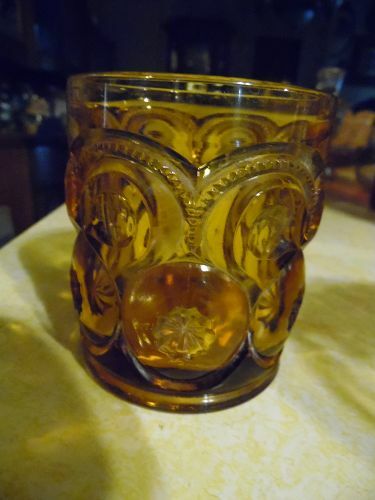 Smith Glass Moon and stars amber cordial or egg cup 3 3/4"
Hard to find Smith Moon and stars 3 3/4" tall cordial glass. 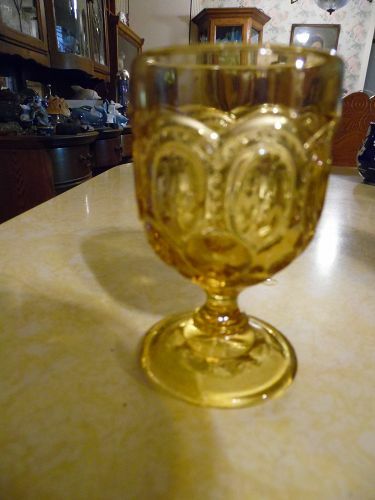 They also list it as an egg cup, and it seems it is rare to find in this size. Replacements have them listed at 39.99 ea. I only have one in this size and it is in perfect condition. Lidded canister/apothecary jar. Amber/Gold in color. Made by LE Smith in the moon and star pattern. Measures approx. 5 1/2" in diameter x 9 1/2" tall with the lid on.There are some chips on the inside edges of the lid. The condition outside is very nice. 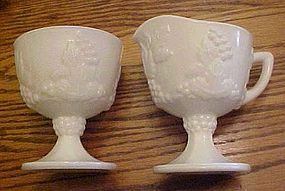 Indiana Harvest Grape Milk Glass footed creamer and open sugar set. Excellent condition with no damages. 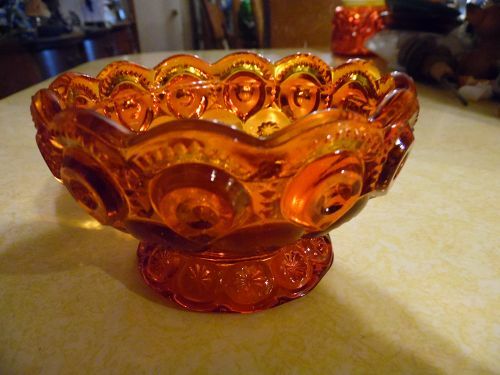 They were made by the Indiana Glass Company.